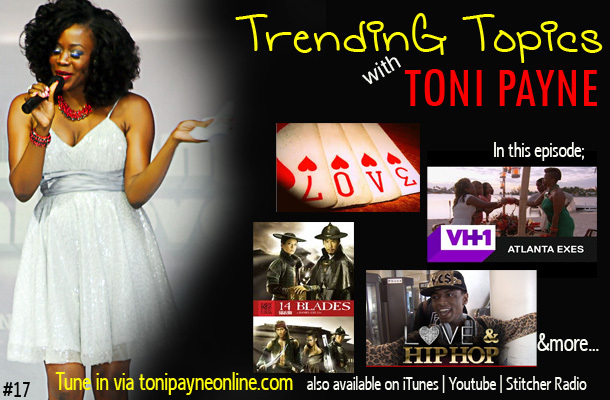 Trending Topics with Toni Payne talks; Loving a broke man, is it worth it? Bants about VH1’s Atlanta Exes starring Tameka Raymond, Christina Johnson, Monyetta Shaw, Sharee Buchanan and Torrie Hart. I also discuss the new show Love and Hip Hop Hollywood staring Ray J, Omarian and a host of others. This is where I discuss all the hottest topics in pop culture, lifestyle, news and entertainment. I also give you all the latest updates on Music and Movies showing in theaters. Tune in and don’t forget to tell a friend. It is guaranteed to be an awesome episode. This episode is also available on iTunes, Stitcher Radio, and Youtube, Soundcloud, Hulkshare, etc. If you enjoyed this episode, kindly subscribe, share, rate and comment. Loving a broke man, is out of it, when you love a broke man, you don’t have choice to be broke as well, and if you are rich be ready to wrecked, just because you are in search of a guy who will climb aisle with you and you think a broke man would love and respect you, then you are in for it, instead of them to go out and look for something doing, they would rather sleep on the sofa and expecting [your money] and if you deem fir to set them on business, am sorry its another way for them look at the other women outside there. My ex was the couch type and he cheated on me when I’m at work providing till I saw another girl in our car. Never again. your hip hop is very famous.